I’ve been listening to the radio on a way to work a lot, and something about many of these songs has been bothering me for a long time. But today, I finally found the answer. It’s because every other song on the radio is about Satan. Don’t believe me? Well, let’s look at some examples. Just look at the picture and think of it when you read the song names. Bruno Mars “Locked out of heaven”. That one is pretty much self-explanatory. Adele: “I set fire to the rain”. This is totally something Satan would do. Or someone like him. Taylor Swift: “I knew you were trouble when you walked in”. But it’s not like a minor detail like that would ever ever stop Taylor Swift from starting a meaningful relationship. Flo Rida “Hey I heard you were a wild one…”. Yes, “wild one” is just one of the many names Lucifer is known by. He certainly hasn’t been domesticated. Alicia Keys “This girl is on fire”. 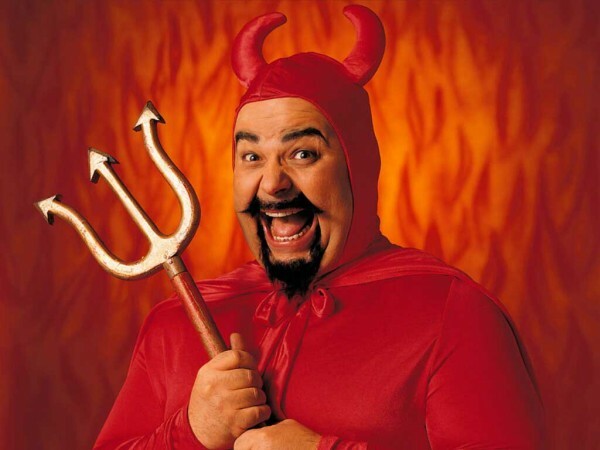 Now you are probably thinking, “wait a minute, Satan isn’t a girl…” But isn’t it a sign of bigotry and close-mindedness to assume that Satan has to be male? Seriously, it’s time for a woman to break the brimstone ceiling. Mumford and Sons “I will wait, I will wait for you”. He would, wouldn’t he? The Script: “Standing in the hall of fame, and the world’s gonna know your name”. With so many famous people in hell, like Hitler, Stalin, bin Laden, Jack the Ripper, hell is the ultimate hall of fame. And if the world’s going to know anyone’s name, it’s Satan’s, not the Script’s, whoever they are. Kelly Clarkson: “Everybody’s got a dark side, do you love me? Can you love mine?” I had no idea that Satan was so clingy and insecure, but how could someone so cute and innocent like Clarkson have a dark side? Carly Rae Jepsen: “Call Me Maybe”. Ok, maybe this song isn’t not about Satan, but I have a pretty strong suspicion that Satan wrote this one personally. when i was about 16 years,i used to laugh and hate those who were listening to secular music.little did i know that one day i could also fall under their fate.right now you got no idea how am addicted to SATANIC SECULAR MUSIC. I don’t know if all of you realize but in “set fire to the rain” Adele says this. well now we know whom is claiming her fallen heart. not change among religions because satan is tempting in all religions. read the holy bible and you will get the truth. ask Jesus Christ guide you and help you to undestarnd and not misinterpret the word of God for all of us. the conspiracy of a new world order exists. faith is lost and grows pagan religions because people are going to looking for it..
God bless you and to your family too. PD. perhaps I will be the mockery of many, but I do not care! I haven’t listened to that song as carefully as you did, but you’re right! She does name Lucifer as her apparent love interest! I was led to this site by a few clicks and google search. My husband and I were listening to Bruno Mars ” Locked outta heaven” it happened to be my favorite song until we really listened to teh lyrics and thout wait a minute, this song is about Satan. Lucifer was the leader of music, it has Satans stench all over it…………………We have been awakening anyone we know………..For His time is short here on earth………………….. Yes, on the Internet nowadays, it only takes a few clicks and Google searches to find Satan. I think I must tell you the truth that Hanna Montanah or Miley Cirus is showing her true colours now….and I say ! RUN ! RUN for your life !!!!!!!!!! Lets all run for the hills with no radio ! And..no..computer…ehh wait…u know what we can do this we can drag eachother trough this thing! …… Just YES. 😀 although it has given rise to a number of VERY funny parody videos ……. Well, of course, we must do all we can to fight this evil. You can throw in anything by Justin Bieber, which is Hellish touture, and definitely something Satan has had a hand in. I mean, seriously — how ELSE would this kid have become a superstar?!? There definitely had to be a soul-for-fame contract involved. Bieber is definitely in that league. But I don’t think selling one’s soul can get one that far as Bieber got. I’m pretty sure there has to be some close blood relationship. Good point. Maybe the son of Taylor Swift and Satan. The Dark One seems like the kind of guy she’d fall for. That can’t be, Bieber and Swift are about the same age, I think. Though Swift dating the Dark One or Bieber isn’t out of the question. Good point, although Swift could be 40 for all we really know. Seriously though, I suspect Bieber and the Dark One are the same being. I know, I’m starting to fear my car radio now.